According to the story told in Ovid's Metamorphoses, the god Jupiter, smitten with the nymph Europa, transformed himself into a white bull and abducted her. Here Jupiter swims away with Europa on his back attended by a host of sea deities. Celebrated since it was entered in a royal painting competition in 1727, this picture has been in Philadelphia since 1815. It belonged to Joseph Bonaparte, who lived here in exile following the fall of his brother, the emperor Napoleon. A member of a distinguished family of artists, Noël-Nicolas Coypel entered this work in a now-famous competition among twelve leading French painters that King Louis XV called in 1727. His submission did not win, but numerous visitors to the exhibition of contest paintings commented that Coypel's was by far the finest. 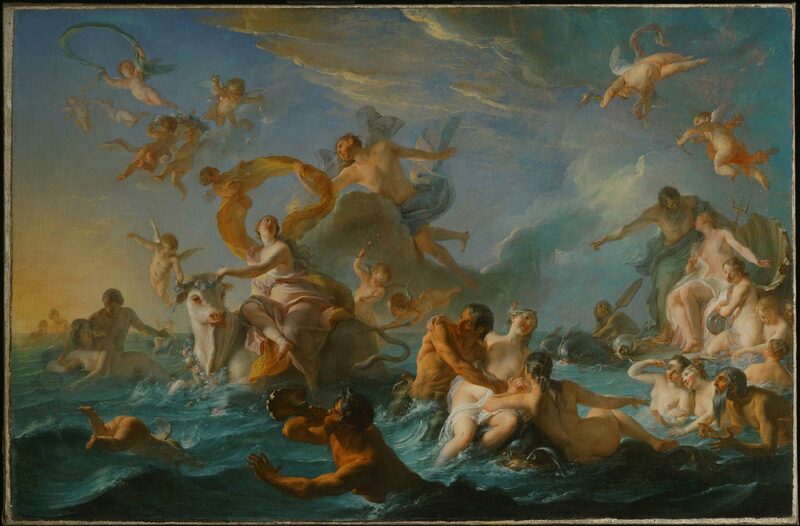 Coypel chose a traditional mythological subject, based on Ovid's Metamorphoses: in love with the beautiful Europa, the god Jupiter transforms himself into a bull and abducts the nymph. What surely attracted critical attention was the new tone that Coypel's painting introduced into French art, for the palette, ranging from brilliant yellow to palest pinks and blues, the dance of sunlight across the picture plane, the refined, subtle gestures of the figures, and the delicate emotions that play across their features all anticipate the Rococo movement. This painting has been in Philadelphia since 1815, when it came with the art collection of the exiled Joseph Bonaparte, brother of the fallen Emperor Napoleon, and was given by Bonaparte to the Cadwalader family, in which it descended. Christopher Riopelle, from Philadelphia Museum of Art: Handbook of the Collections (1995), p. 179.